What’s the joy of an island without beaches? Marco Island in southwest Florida has some wonderful beaches with beautiful views of the Gulf of Mexico. After all, it’s Marco beaches that make magic. The island – the largest of the Ten Thousand Islands – features a magnificent shoreline that stretches from Tigertail to South Beach. 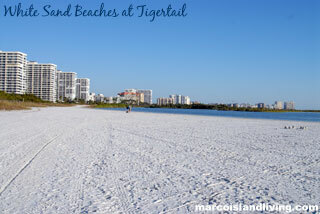 Ask us about Tiger Tail Beach on Marco Island FL or share comments. To feature your business, contact us. Enjoy miles of clean, uncrowded beaches of white sand and famous Marco sunsets. Marco Island Beaches are world famous – one visit here and you will understand why. Marco Island’s crescent shaped beach extends the entire length of the western side of the island – which happens to overlook the beautiful Gulf of Mexico. The “Marco Flash” is the flash of deep blue or green light occurs very seldom but always just after the sun sets into the Gulf of Mexico. Marco Island Beaches are patrolled and are not available for overnight camping. Don’t even think about camping out on Marco Island Beach – the beach patrols are l ooking out for any unlawful activity, especially just after sunset. Unless you are staying at a beachfront resort or condo you are not permitted to enter Marco Island Beaches after 10:00pm. Marco Island , and the rest of the 10,000 islands in the Florida Everglades, is an important nesting and migrating area or birds. Wildlife and bird viewing, or “birding” is a popular outdoor activity. You should be careful not to disturb island birds and turtles when visiting Marco Island Beaches. Several of the island’s birds and turtles are on the endangered species list and fines are imposed for violators. Due to Marco island’s important and fragile ecosystem dogs or pets of any kind are not allowed on any Marco Island Beaches. Tiger Tail Beach is a popular beach for birders and wildlife photographers. Every spring you can view Osprey nesting, Crane migration and various birds. Tiger Tail Beach is the most unique beach on Marco Island. To reach the ocean side of the beach you must walk across a shallow bay. Unless you do not mind the feel of muck between your toes, then bring along a pair of old sandals or other light footwear. Only bring what you can easily carry above your waist. 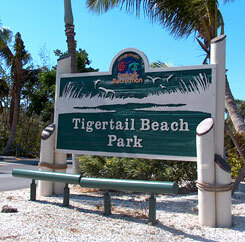 Tiger Tail Beach features a snack bar with decent fried fish, burgers and other snacks. There is also a childrens’ playground, picnic tables, and restroom facilities. Educational signage and displays may be found near the playground and snack bar area. With recently installed walkways this beach is quite magnificent. Parking will require a Collier County Florida Beach Pass on your vehicle or pay a small fee. There is plenty of parking at Tiger Tail, though it does sell out, especially during peak season on sunny days. Get to the beach early to assure a parking space. 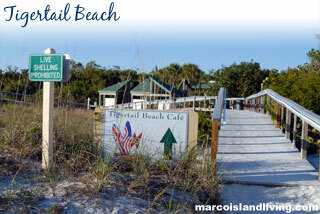 Follow the links below for more information about Marco Island Southwest Florida Beaches. 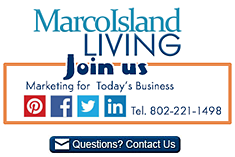 Thank you for visiting Marco Island Living.com.